A parliamentary report of 1777 recorded parish workhouses in operation at Seven Oakes (with accommodation for up to 80 inmates), Brasted (12), Chevening (20), Chiddingstone (30), Cowden (24), Eaton Bridge [Edenbridge] (40), Halsted (6), Kemsing (13), Otford (20), Sundrish [Sundridge] (40), and Westerham (50). Sevenoaks had a parish workhouse on St John's Hill, at its junction with Camden Road. Chiddingstone's workhouse was located at Somerden Green. County of Kent: Brasted (2), Chevening (2), Halstead, Kemsing, Otford, Seal (2), Sevenoaks (4), Shoreham (2), Sundridge (2), Westerham (2). The population falling within the Union at the 1831 census had been 13,240 — with parishes ranging in size from from Halstead (population 242) to Sevenoaks itself (4,709). The average annual poor-rate expenditure for the period 1831-4 had been £11,970 or 18s.1d. per head of the population. The new Sevenoaks Guardians were recommended by the Poor Law Commissioners to build a new workhouse to accommodate the union's paupers. However, they decided instead to alter and enlarge the existing Sevenoaks parish workhouse on St John's Hill. In the winter of 1840-41, the number admitted to the workhouse exceeded what the Commissioners felt acceptable for the "health and comfort of the inmates". Children in the workhouse were also found to be suffering from "certain glandular affections". In December 1841, an official inspection of the St John's Hill workhouse was carried out by Edward Rigby M.D. and Henry Hancock on behalf of the Poor Law Commissioners. As well as exposing an extraordinary degree of overcrowding, their report provides a detailed picture of the workhouse buildings. Bed-rooms, Boys.—There are four allotted to the boys; the largest measures 27 feet by 16, and nine feet high, The next in size, which opens into this, measures 21 feet by 16: there are three windows in the first and two in the second, and each of these rooms open at their further ends into two very confined rooms, which are used as workshops, the one for tailors, the other for shoemakers from among the boys. These rooms are very defective, not only from the converging nature of the ceiling in the roof, but also utterly inadequate to accommodate the present number of inmates, which amounts to 62 boys and 2 men. This number occupies 17 beds, 15 of which are six feet long by four feet and a-half, in each of which sleep four boys; in the two others, which are about half the size, a man and a boy sleep. There is only a space of about 13 inches between each bed, the two flanking beds being pushed up close to the wall, and a free passage down the middle of four feet wide. The floors and walls were clean, excepting at one end in each room, where the wall as well as the floor was soaked, from a tub being kept in each room as a common receptacle, instead of urinals for each bed; this is removed during the day, but must necessarily be very offensive during the night. The bedsteads were of iron, the bedding fairly clean but old, especially the blankets, which were very thin, no under blankets being provided. The two other bed-rooms for the boys are at some distance from the above; they ate both eight feet square and seven feet one inch high. Each of these small apartments contains two beds, which completely fill them; six children sleeping in each room; there was a window and door to each. Bed-rooms, Girls.—There are two bed-rooms for the girls; the larger opens immediately out of their school-room, and measures 33 feet by 18; it contains nine beds, in which sleep 34 girls, besides a female attendant: the other is of the same size, opening out of the former; it contains 10 beds with 40 children; the bedsteads are the same as the boys, but the beds and bedding are decidedly better. Both of these rooms are airy and spacious apartments, being well lighted and ventilated, with flat ceilings, and were very clean, a proper supply of urinals being provided. Women and young children.—Another room of the same size, for women and the younger children, contains nine beds, in four of which two women and one child sleep in each; in three others 12 children; and in the others, which are smaller, two children; this room was also clean and airy. Women.—There are two bed-rooms for the women, which are clean, airy, and spacious, with iron bedsteads and good bedding; in one of them they sleep two in a bed; in the other, which contains 10 beds, one child also mostly sleeps in each. Bed-rooms, Men.—There are three bed-rooms for the men; two of these measure 30 feet by 18, one being nine feet high, the other seven feet high; each contains 11 beds and 21 persons; a third room of the same size contains 10 and 20 persons: these rooms are equally well ventilated, airy, and clean. The Lying-in Ward.—Measures 12 feet by 10; we do not consider it well adapted for the purpose either in size or accommodation; it was warm when we visited it, and so far comfortable, but is deficient in a supply of water and the ordinary furniture requisite for such au apartment. It contains two beds, in which three persons at present sleep; viz., a woman lately confined with her infant in one, and the nurse with another woman, expecting shortly to be confined, in the other. On questioning her who had been recently delivered, she informed us that the sheets of her bed had been changed three times within the fort night, her body linen as often, and that she and her child had been supplied by the mistress with two dozen napkins, which were washed as often as necessary; this we consider sufficient. She likewise informed us that the fire is kept up during the day, and also all night if necessary: the bedding was excellent and the women looked healthy. Adjoining the lying-in ward is a small sleeping room without a fire-place, measuring nine feet and a-half by seven feet and a-half; it contains two beds, in one of which at present sleeps the laundress, who acts occasionally as midwife in the absence of the medical man; the other is another woman expecting her confinement. Cleansing Wards.—We visited the two rooms called the "Cleansing Wards,' which are for the reception of paupers who have not been examined by the medical man, or undergone the usual cleansing before being allowed to mix with the other inmates; they consist of a day and night ward for the men and the same for the women, the day ward for the latter being used for the bath-room. These rooms were 14 feet square; there was a good fire in each day-ward; each sleeping ward contained three beds, which were very old and dirty; there were two men on one side and two women and a baby on the other. Daily Washing.—The means for the daily washing in the morning are very defective, consisting merely of open sinks, exposed to the weather, instead of proper troughs in a room adapted for the purpose, and with a good supply of warm water, soap, towels, &c. The half cellar, half out-house, which is occasionally used for this purpose, is quite objectionable. Sick Wards.—There are two, one for the males and one for the females; the former contained nine beds, of which all were occupied; the latter seven beds, of which five were occupied; the men's ward struck us as being close: these rooms measured 36 feet by 12, and were sufficiently lighted; they had each a water-closet attached. Schools-rooms and Day-rooms.—The school-rooms of the boys and girls, as well as also the day-rooms for the men and women, were airy and comfortable. General appearance of the Children.—The general appearance of the children was remarkable healthy; there was not a single child in the sick wards. Health.—After a careful examination of each child separately, the only diseases we could detect were enlargement of the thyroid gland, chilblains, and scald head; the enlargement of the thyroid gland and chilblains were chiefly among the girls, whilst the scald heads were chiefly among the boys: this latter we attribute to the boys not always sleeping in the same bed. The enlargement of the thyroid gland, except in one girl, were of the most trivial nature, and in most instances had distinctly occurred before entering the house. There were also five cases of disease of the eyes, all among the boys, and one case of scrofulous disease of the arm-bone. We attribute the occurrence of chilblains among the girls to their not having the same opportunities and means of active exercise which the boys enjoy: they have no circular swings, skipping ropes, &c., which, among other things, we suggested. Cleanliness.—We found the persons and clothing of all the children remarkably clean; they were cheerful and seemed perfectly happy. In conclusion, we desire to draw your attention especially to the state of the boys, and particularly to their very crowded condition. it is our opinion that never more than two children should sleep in the same bed, and that a space of at least 20 inches should be between each bed; the large bedsteads, which are now in use and contain four children, should be changed for smaller ones. Workshops.—That there should be larger workshops, not only for a greater number of boys, but also for a greater variety of trades, as carpenter, blacksmith, &c.; that every boy should thus be taught a means of earning his livelihood, and that these occupations should divide the time with that devoted to the school; as at present out of the whole number only 28 are taught. Bed-rooms, &c.—That the tub in each of the boys' bedrooms should be abolished, and a sufficient supply of urinals substituted. That the boys' beds be furnished with under blankets. That the rule be established that all the children, and also the men and women should open their beds thoroughly, and unmake them the moment they rise in the morning, and that the beds should be left thus to air for two hours. That the bedsteads in the boys' bed-rooms are much too close; that the bedsteads are too large, and that not more than two ought to sleep, in the same bed: this applies also to the girls. Washing.—That means be established fir ensuring an ample supply of warm water; that the washhouses be furnished with proper troughs at which all the children can wash in warm water every morning, and which would serve for washing the clothes at other times. That there be a better supply of soap and coarse towels. Lying-in Ward.—That the lying-in ward be furnished with a proper leather, with a wash stand, basons, towel-horse, more chairs, a pan to wash the child in, and a better supply of water. Day-rooms.-That the day-rooms should be furnished with benches with backs to them, and arms, especially for the old men and women. School-room-That the girls' school-room is ventilated chiefly by open windows, under the full draught of which the children sit, with their bare necks, in winter-time. We think that a good hot air stove would be preferable to the open fire-place. Amusements.—That a circular swing, skipping-ropes, &c., be provided for the girls. Food.—That the present meat puddings are an indigestible form of food, and that it would be better, and we think cheaper, to have baked or at any rate boiled meat, with vegetable instead, the broth to form the drink at dinner-time, especially with the predisposition to enlarged gland. That the boots for the girls are out of all proportion thick and clumsy, and that the majority of their feet had already suffered from the distortion produced by the bad shape of their boots. Clothing.—That the boys should wear flannel shirts during winter. That the girls should at least have their frocks made higher up them neck, with sleeves covering the elbows: we think that during the winter they should have flannel shifts, a far better article of dress than the stays and wooden busk which they now wear. We lastly call the notice of the Board to a very important point, viz. that great girls of 18 are obliged to be kept in the school among the younger children, there being no day-room for them except among the women who are of the worst character, and with whom it would be highly improper for them to associate. In the wake of this report, the Sevenoaks board relented and decided after all to erect a new workhouse. A ground plan of the St John's workhouse site is shown below, probably drawn up in 1845 when the site was for sale, following the opening of the new Sundridge workhouse. Sevenoaks St John's Hill workhouse plan, 1845. Sevenoaks main building from the south-east, 2001. Sevenoaks main building from the north-east, 2001. 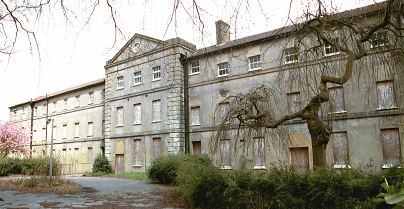 Sevenoaks infirmary from the north-west, 2001. The workhouse later became Sundridge Institution catering for mental patients. 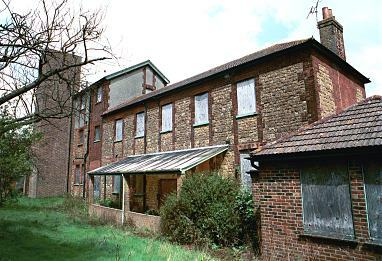 Under the National Health Service, it became Sundridge Hospital but this closed in the late 1990s. The buildings have now been refurbished for residential use under the name Birchfield House. 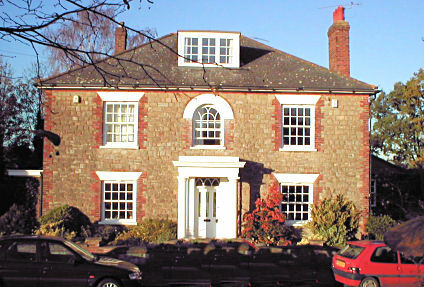 The Sevenoaks Union operated a children's home at Riverhead on Chipstead Lane opposite the north-eastern corner Chipstead Common. Rock House was purchased in January 1911, a large house to accommodate up to 30 children below the age of ten. It was opened by Countess Stanhope on October 15th 1912. Kent History and Library Centre, James Whatman Way, Maidstone, Kent ME14 1LQ Holdings include: Guardians' minutes (1866-1930); Births and baptisms (1846-1932); Deaths (1866-99); Creed registers (1893-1923); Admissions and discharges (1898-1932); etc. Thanks to Carol Cheeseman for her contribution to this page.